Gulf Medical University (GMU), Ajman, the leading medical university in the Middle East region has entered into an agreement with University of Central Florida (UCF), Florida, one of the largest universities in the US with around 67,000 students, for collaboration in offering the Executive Master’s Program in Healthcare Management and Economics (EMHME) launched by GMU’s College of Healthcare Management and Economics. 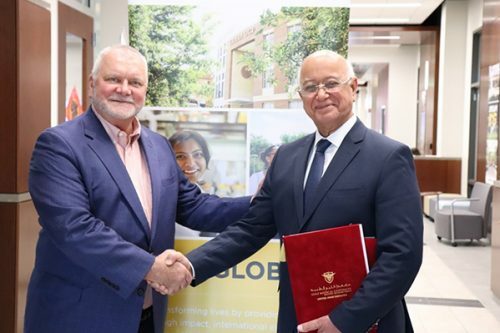 The agreement between both the universities was signed at the UCF campus on 6th February 2018, represented by Prof. Hossam Hamdy, Chancellor of GMU and Prof. J. Jeffrey Jones, Vice Provost of UCF Board of Trustees. The MoU signed between both the universities will promote joint initiatives in teaching, research and community outreach, in addition to facilitating student and faculty exchanges between both the institutions. Both the universities will also undertake joint research and development activities, jointly organize courses/conferences/symposia and launch joint academic programs. The 12-month Executive Master’s Program in Healthcare Management and Economics program, established to benefit middle to senior level professionals in the healthcare industry, seeks to help working professionals to improve their career prospects and widen their professional networks. It equips graduates with broad knowledge and skills in management, policy, economics, and in-depth experience in healthcare industry, innovation and informatics. These types of graduates will be highly needed for the healthcare sector and all related future businesses and services. The program will start from September 2019. In addition to the Master’s program, GMU’s College of Healthcare Management and Economics also offers a four year Bachelor of Science in Healthcare Management and Economics (BSc. HME) designed to graduate professionals with a deep understanding of the healthcare industry, its language and unique culture. This program will start from March 2019. The programs offered by the College of Healthcare Management and Economics are accredited by the Commission for Academic Accreditation, Ministry of Education, UAE. Other leading international Universities collaborating with GMU for delivering the programs include the University of Milan, University of Arizona, American University of Cairo, etc. The college is a member of the European Healthcare Management Association. The faculty for the executive master’s program are top academicians and practitioners from renowned international institutions in the US, UK, France and Italy.